Want to grow your own vegetables in your front yard? Well, forget it. The city council decided it will remain illegal to do so. 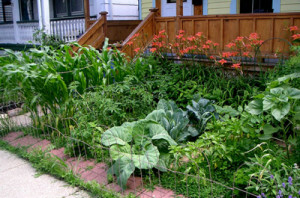 Thinking of planting a vegetable garden in your front yard? Well, don’t. It will be in violation of the city’s updated noxious weeds ordinance. While most people probably don’t think of doing this, it is not unheard of. And Mayor Karen Majewski, who is a vegetarian, is also a champion of it, saying there is no good reason to object to it. “What’s wrong with growing vegetables in your front yard?” Majewski said. Asked to explain further, she said there is an environmental reason to support them. “There’s a growing trend toward less lawn. We’re kind of late to this game,” she said. Indeed there is a growing movement of allowing front yard vegetable gardens, but there is also plenty of debate over the matter. Three years ago the City of Oak Park threatened to jail a woman for 93 days over vegetable planters she installed in her front yard to grow tomatoes, zucchinis, peppers and other veggies. The incident made national news. Oak Park officials eventually backed off from prosecuting the woman, who also pointed out that First Lady Michelle Obama created a vegetable garden in the front of the White House in order to encourage healthier eating. Despite the urging of Majewski to allow front yard gardens, the city council declined to amend the ordinance. “I think we stand a good chance to amend it,” she said.